“Microplastics and Medusae – Expeditions into H₂O” is an interdisciplinary project-concept on the topic “Plastic pollution of aquatic environments” which I developed on the basis of several research travels to scientific laboratories in France and Germany specialized in this domain. It explores the topic through a poetic prism, bringing together the arts with current scientific research as well as philosophical currents dealing with concepts of “responsible citizenship” and “sustainable development”. The concept premiered in 2017/2018 as part of an interdisciplinary seminar for a mixed group of students from the Berlin University of the Arts (UdK) and the Technical University of Berlin (TU), directed together with my colleague Henning Wehmeyer – in partnership with thirteen scientific institutes throughout Germany. We are excited to present some of these creations now together with other artists at the Mikve, 1014 Budapest, Palota Street 1 (12th – 23rd October). The exhibition space is an old jewish bath and the exhibition is part of the Art Moments – The Universal Sea Budapest Festival. Exploring experimental methods as a strategy to find and invent new pathways, is a vital element not only in scientific but also artistic working processes. What kind of new artistic language with respect to form and methodology can UdK students discover when they depart from their art studios, rehearsal rooms, stages, and venture together with students from the TU into the laboratories of scientists? Conversely, will TU-students be able to derive new impulses for their thinking processes by transferring artistic perspectives to scientific challenges? To what extent can art serve as a communication bridge helping to make complex research topics on “microplastics” accessible to a broader public in order to raise awareness for a responsible and sustainable interaction with nature? 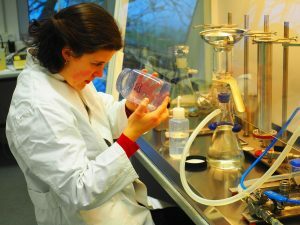 During the first part of the seminar, the students embarked on research travels to the scientific institutes where they dived, together with the scientists, into the current laboratory practice on microplastics – these microscopic synthetic particles which have been detected in oceans, rivers, marine animals as well as in tap water, abrasions of our “plastic society” which may also constitute a risk to human health? In the second phase of the seminar, the students then faced the challenge of transforming this experience into hybrid artworks. Fine Arts student Anouk Tschanz during her research travel to the AWI Helmholtz Centre for Polar and Marine Research, located on the deep-sea island Helgoland – as part of the seminar Microplastics and Medusae at the Berlin University of the Arts/Technical University of Berlin. The video/audio-installation which she created together with Paul Angermeyer (study course: Communication in Social and Economic Contexts) on the basis of this research is devoted to the scientific process of visualising microplastics and to the metaphor of filtration. Read more about the cooperation.